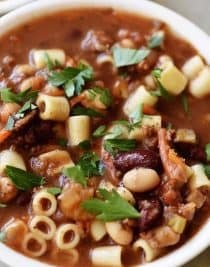 Pasta Fagioli Recipe – If you love the Olive Garden Pasta Fagioli recipe, then I think you’ll love this homemade version as much or more! Ready in 30 minutes! Oh friends, do I have a scrumptious recipe for you all today! I’ve mentioned before about how my college friends and I would make our routine trek into Atlanta many, many moons ago and would always somehow wind up in Olive Garden for our supper. It was like our cars had automatic steering locked in on that place! Since then, I’ve visited a time or two, but I’m not as frequent of a visitor as I was all those years ago. 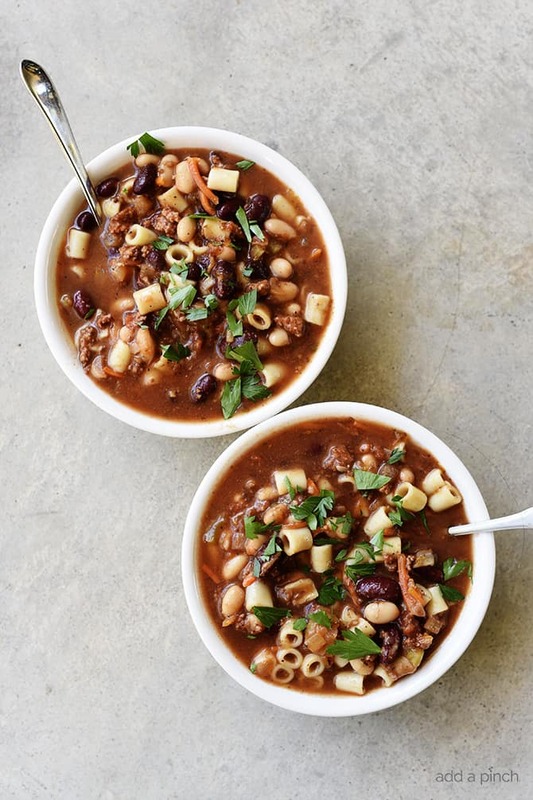 But, one of my favorite things to order during the cooler months has always been their Pasta Fagioli. And over the years, I’ve worked to get the recipe as close to the original as I possibly could. Since I’ve now made the recipe so that it is homemade and ready in 30 minutes, I think I should invite my college friends over for a bowl. 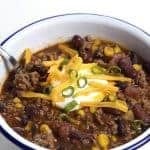 Even though this recipe includes more ingredients than I normally include in recipes, it really couldn’t get much easier to whip up on a busy weeknight, for a soup buffet throughout the fall for Halloween, for watching the game, or to cozy up on a chilly day! 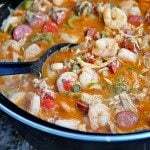 Since this quick and easy one pot recipe comes together in less than 30 minutes, it is one that you’ll most likely turn to time and again! At least I do! You’ll brown your ground beef in a large stockpot over medium heat and then drain away the drippings from the beef and stir in your vegetables and cook until the vegetables are just tender. You’ll notice that I’ve grated my carrots with a box grater. This reduces the cooking time for the carrots considerably. Once the vegetables are just tender, I stir in my stock. For the stock, you can use vegetable stock or chicken stock based on what you have on hand or your personal preference. Along with the stock, stir in your tomatoes and tomato sauce and spices. Bring the liquid to a boil and then stir in your pasta and beans (including the liquid from the beans). If there is not enough liquid to cover the pasta, you can add water or additional stock to thin out the ingredients. Then reduce the heat and allow to simmer until the pasta is al dente, about 10 minutes. 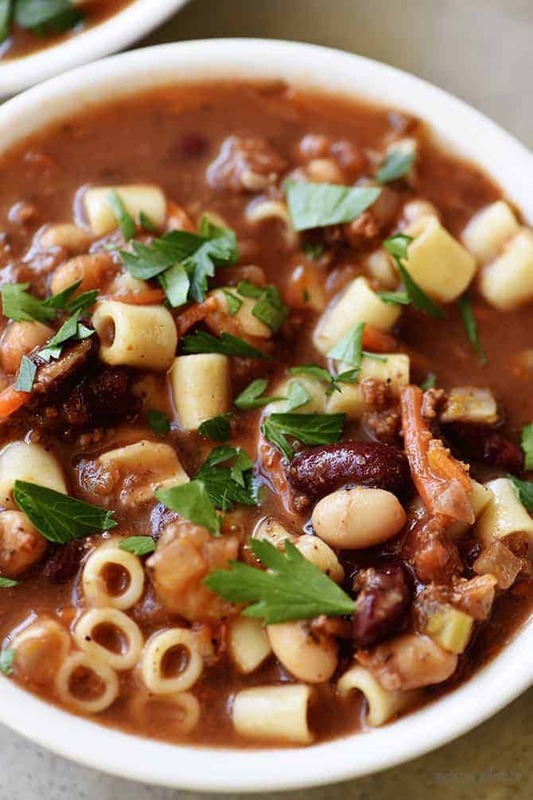 Here’s my Pasta Fagioli Recipe. I hope you love it as much as we do! Brown ground beef in stockpot set over medium heat, stirring frequently until cooked throughout, about 5 minutes. Drain away any drippings from the beef and stir in the onions, carrots, and celery and cook until just tender, about 3 minutes. Stir in the garlic and reduce the heat to low. Stir in the stock, tomatoes, tomato sauce, basil, oregano, thyme, salt and pepper. Bring to a boil and stir in the ditalini, along with the beans and their liquid. Reduce the heat to medium and cook until the vegetables are tender and the pasta is al dente, about 10 minutes. Serve warm with grated Parmesan cheese and parsley, optional. 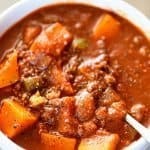 For a vegetarian version of this soup, simply omit the ground beef and use vegetable stock. Allow soup to cool. Place into the refrigerator in an airtight container and store for up to 5 days. Allow soup to cool. Place into freezer-safe container and store for up to 3 months. To reheat, allow to thaw in the refrigerator overnight and reheat over medium-low heat on the stovetop until heated throughout, about 15 minutes. This sounds great! Do you have any ideas about how I could turn it into a slow cooker recipe? I think it could deepen the flavors of the veggies and spices, but I don’t want to turn the pasta into mush. Thoughts? 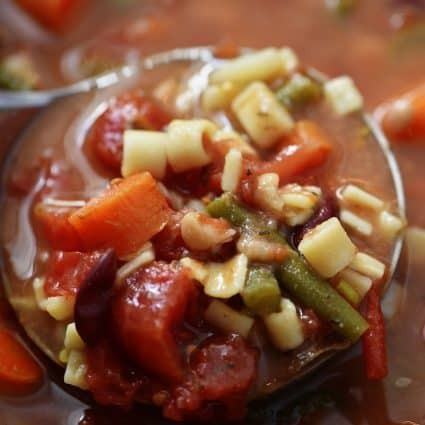 I’ve done a minestrone similar to this in the crock pot, which has you add the pasta during the last half hour of cooking to avoid it overcooking. Might be worth a try here as well. I just made this (for tonight’s dinner) and I’m doing QC for lunch. OMG – this is slap yo mama good!!! One tiny issue with the recipe – in the ingredients list you instruct to drain and rinse the beans. (I did neither) BUT in the instructions you “stir in the ditalini along with the beans and their liquid”. Otherwise, this is going to be a perfect cold night supper. thank you. Hi! I’m so glad that you enjoyed it! Isn’t it just about the simplest thing ever and I love that it is made all in one pot! I have always been told to drain and rinse the beans due to “poisonous” elements. Is this not true? is it for certain beans only?..Am concerned that I will be cooking incorrectly. Oh my goodness, I’ve not heard that and certainly wouldn’t want to eat beans that had been canned in poisonous elements – even if they had been drained and rinsed. 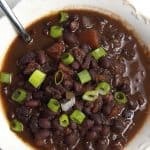 If you are concerned, you could definitely drain and rinse the beans before adding to the soup. Then, if you need additional liquid, just add water or additional stock as needed to replace for the liquid in the beans. I find it quite unethical to claim a recipe as yours and as something you have worked on, when in fact the original source of this recipe is Jaclyn from Cooking Classy who blogged about it quite a while ago. I certainly do appreciate you taking the time to visit and leave a comment! However, I can assure you that your claim is not correct! 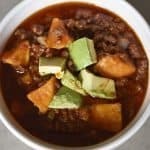 I absolutely adore Jacklyn and I just visited Jacklyn’s recipe to see where you might be coming from in your comment. Since we both have made a soup by the same name based on the same restaurant version, you can expect that many of the ingredients would be the same. What you will find if you do look at both recipes is that our cooking methods are very different! You will also find that the ingredients list varies greatly in that mine does not include many of the ingredients that are found in Jacklyn’s. I hope that you take this response in the courteous way that I intend for you to receive it, but please realize that claims such as yours are extremely hurtful and not appreciated in the least. I didn’t intend to be rude or hurtful. I just generally don’t like the idea of people stealing recipes and claiming it as their own, I found the recipes very, very, similar – almost the same with just slight changes to ingredient names, and skipping the marjoram in CC’s recipe… and so it prompted me to comment what I did. No ill intentions. I’ll take your word and take back mine. Nevertheless, I will be trying out the recipe this week ???? Needed a good dinner tonight and with a rainy day this email popped up and I was on it! Delicious and everyone loved it! Thank you AGAIN! Will you please include the nutritional values in this recipe. Also, the calories per serving/cup. Robyn…I am making this an SOON! I had to laugh about Olive Garden. That was absolutely our favorite restaurant in college. It must have been our generation!!! I even remember that the chairs had WHEELS! My mom even had my roommate buy their chocolate cake (a whole one) for one of my birthdays in college. So many Olive Garden memories. 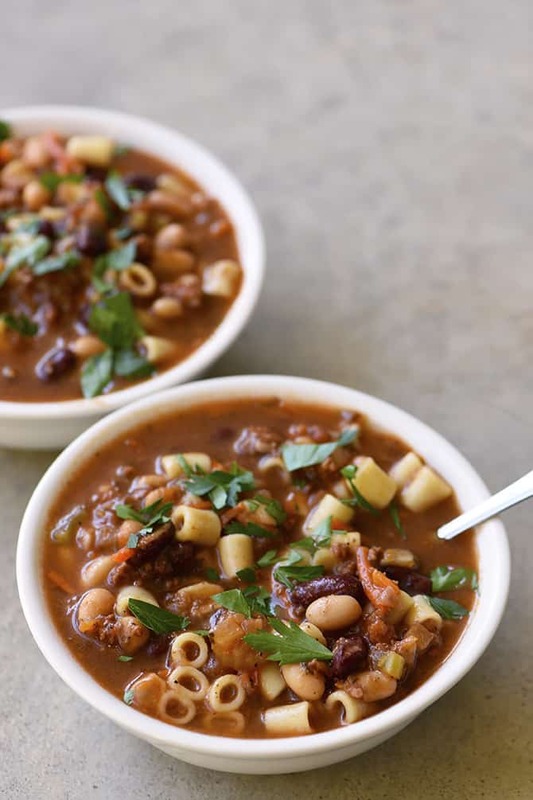 This soup was always my favorite…and I know your version will taste even better! Hi Robyn I see I should have left the bean liquid in the soup,also the pasta keeps cooking after you take it off the stove? Yes, it sounds like you needed more liquid in your soup. The pasta will absorb some of the liquid as it cooks and then if it is cooked in advance, it will continue to absorb more of the liquid. Thanks so much Lisa! It’s delicious and so simple to make! My Italian boyfriend makes pasta for me also everyweek and everytime I ask him but most of them are dried pasta. I’ve never tried with this type. And I love beans a lot, next time I definitely ask my bf to make this xD Looks so yummmmm! I love this recipe! Made it for dinner tonight and family loved it! 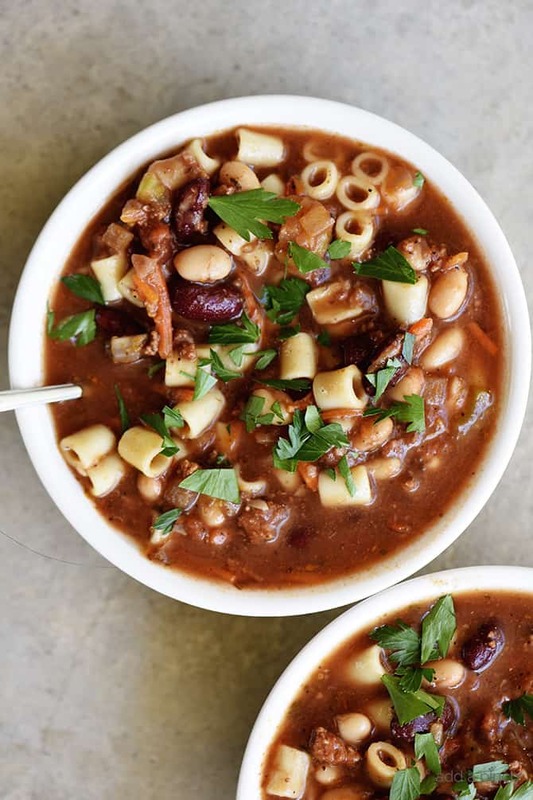 You need to try this soup using italian sausage instead of ground beef or go half and half. Thanks for the yummy recipe! I cooked the pasta separately and combined right before serving to prevent overcooking. Enriched version of what we make. Beautiful ! Thank you so much ! Hi Robyn quick question. I noticed the recipe calls for chicken or veg stock but in the video you used beef stock. Obviously any of these options would be delicious but I wondered which you think tastes the best. Thank you! I read the recipe over & over, nowhere did it say drain the liquid from beans. You are correct Mary. You do not drain the liquid from the beans in my recipe. The recipe instructions toward the end of Step 1 say “Bring to a boil and stir in the ditalini, along with the beans and their liquid.” I hope this helps and you enjoy this! Thanks!